And the numbers only get worse from there. 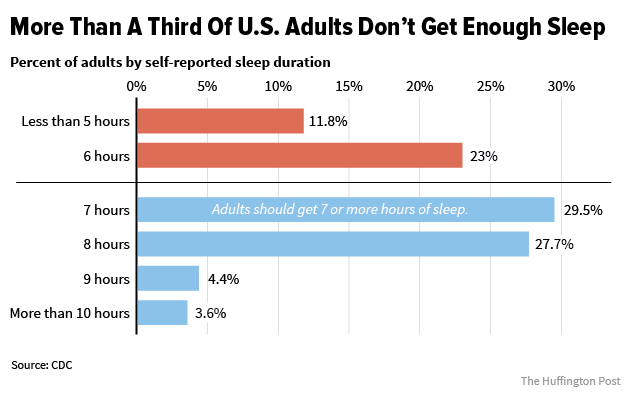 We spend about one-third of our life doing it, but more than one in three Americans still aren’t getting enough sleep, according to a new government report. In their first study of self-reported sleep length, the U.S. Centers for Disease Control and Prevention found that 34.8 percent of American adults are getting less than seven hours of sleep -- the minimum length of time adults should sleep in order to reduce risk of obesity, diabetes, high blood pressure, stroke, mental distress, coronary heart disease and early death. In total, an estimated 83.6 million adults in the U.S. are sleep deprived, the CDC report estimates, based on surveys with 444,306 nationally representative participants across 50 states and Washington D.C. That’s 83.6 million sleepy people driving on roads, walking on streets and generally yawning through their lives. A lack of sleep, like so many other health factors, disproportionately affects the poor and underprivileged. Those who are most likely to get the recommended amount of sleep include people over age 65, those who are married, employed, have a college education or higher, and are white, Asian or Hispanic. For instance, 73.7 percent of senior citizen got at least seven hours of sleep a night, while 71.5 percent of people with a college degree or higher got at least seven hours. More than two-thirds of married people (67.4 percent) got a healthy amount of sleep, and the range for whites, Asians and Hispanics spanned 62.5 percent to 66.8 percent. 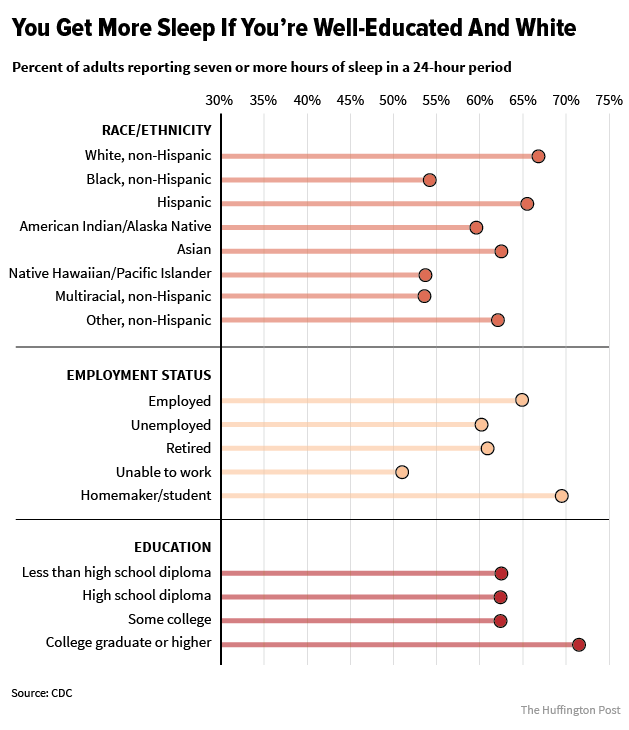 Conversely, respondents who identified as native Hawaiians/Pacific Islanders, black, multiracial and American Indians/Alaska natives all had low rates of adequate sleep -- only about 53.6 percent to 59.6 percent got at least seven hours of sleep a night. People who are unable to work or were unemployed also had lower health sleep rates -- 51 percent and 60.2 percent, respectively. Dr. Clete Kushida, medical director of the Stanford Sleep Medicine Center, said more research needs to be done on the racial and educational disparities that may influence sleep, but he speculated that perhaps stress, lack of a regular workday schedule and avoiding treatment for medical conditions due to financial strain could be some reasons why people without jobs report lower rates of healthy sleep. 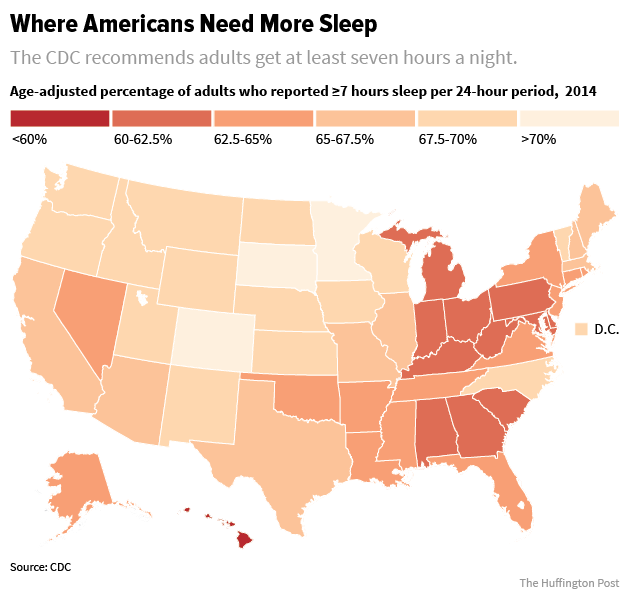 For Kushida, the most interesting aspect of the CDC’s study was the geographical differences in sleep. "The findings are interesting in that it reports some regions, such as the southeastern U.S. and in states along the Appalachian Mountains, that have a lower prevalence of healthy sleep duration, and the similarity of these regions to prevalence estimates for obesity, serious health conditions, and death rates," he wrote in an email to HuffPost. People who live in the Great Plains states had the highest rates of healthy sleep duration, while the Southeastern U.S. and the Appalachian Mountains region had the lowest. The CDC noted that states with the lowest rates of healthy sleep times also have the highest rates of obesity, diabetes and death from heart disease and stroke. There are some drawbacks to the study. The first is that researchers relied on people’s recollections of the number of hours they slept, as opposed to measuring them objectively with motion sensors or sleep journals. It also does not include people who are “institutionalized” in the military, prison, jail, hospitals and the like. Those populations would have likely increased the proportion of Americans who don’t get enough sleep, the CDC notes, as they are more likely to sleep less due to chronic physical or mental conditions. But the survey conveys more accurate information than past research the CDC has published on the subject. In 2012, the agency asked 395,407 people to estimate the number of days they felt they didn’t get enough rest, as opposed to drilling down on the number of hours they think they slept. The CDC recommends several evidence-based tips for getting a better night’s sleep. These include going to bed and waking up around the same time every day (even on the weekends! ); turning your bedroom into a quiet, dark and relaxing room; banishing or turning off electronic devices like TVs, computers, phones and other light-emitting gadgets from the bedroom; and avoiding large meals, nicotine, alcohol and caffeine before bed. These tips may present different challenges for different kinds of people. Those with jobs that entail unpredictable shift work often can't stabilize their sleep and wake times. Alcohol use tends to correlate with higher poverty levels, and people with lower educational levels are more likely to use nicotine, too. Currently, there’s no consensus among professional sleep research organizations about the safety or effectiveness of over-the-counter or prescription sleep aids for the general adult population, according to the CDC. And if you do decide to get medical help for insomnia or other sleep issues, it’s helpful to keep a 10-day journal about when you sleep or nap, and whether or not you did things like exercise or drink alcohol and caffeine -- three activities that can affect sleep quality -- before you see the doctor. Graphics by Alissa Scheller for the Huffington Post. CORRECTION: Due to an editing error, a previous version of this story incorrectly said the study included data from institutionalized populations. It does not.